I went out and patted her on the quarters, turned on the heater, pulled off the passenger fender and door, stripped the guts out of the door.. pulled the rear glass and made a mess of my garage. Today or tomorrow I'm going to drill the holes for the hood scoop in the new hood i picked up off craigslist, test fit the dynacorn passenger door, and put the guts in the new door. probably read up on regluing the windows.. and list some of my extra parts for sale. I don't know about a lot of you other guys and gals.. but early fall when the skies are gray and the air is cold and damp i spend a lot of time just lookin and sippin beer..waitin for the $ to come in! Beautiful color rawlinss. I'm going to paint mine red as well, what is the brand/name of that one? I adjusted valves on the small block car, and pulled out the radiator in the Cobra Jet car and back flushed it. Pulled the flex fan out then in preparation for a reproduction stock clutch fan and radiator fan shroud. Well today I worked on the 65 not the 70 but I will post. Finishing up engine. 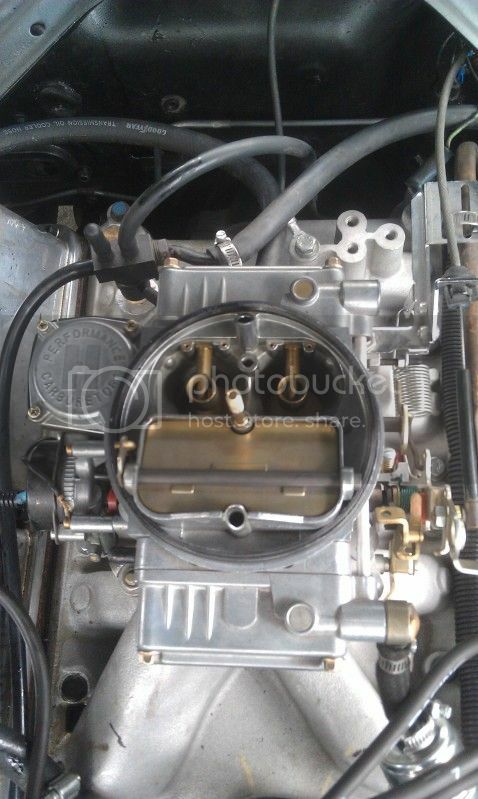 On Friday I installed timing cover, balancer, dipstick, water pump, fuel pump and oil pan. Today I did the alternator, intake & valve covers. Had to quit early for daughters birthday party but it's coming along nicely! Playing on the K code color scheme with my own twist on this one. 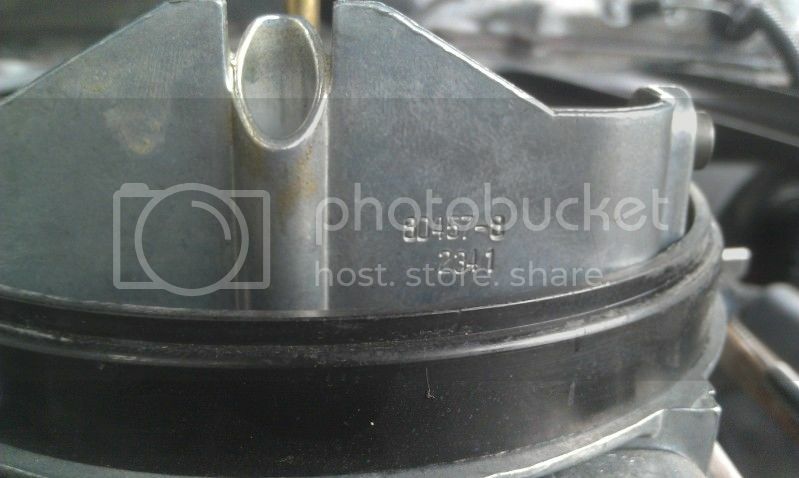 Do the throttle body Spacers help a lot? I have one, just never installed it. I was told they don't work. IIRC a 4 hole spacer gives more (top end) hp, and a single hole spacer gives more (low end) torque. A spacer makes the plenum of the intake larger. What did I do for my Mustang? Started disassembly! See more on my tread. Ah, ok. I have a 4 hole spacer, hp is what I'm looking for since the 351 is already torquey! I don't even know what my Redline is, I dont go beyond 5k. Well I went to the Hilton Head Island Motoring Festival Car Club Jamboree held annually down in Hilton Head Island SC. They were looking for some late model Shelby's to attend and five of us formed our own little group called, "Friends of the Shelby" and attended. Well about two weeks ago my 2011 Shelby was involved in an accident and is in the shop so at the last minute they let me enter my 1970 Mach 1. So I cruised down with my Shelby GT-500 buddies. Two are Shelby Super Snakes and the other two have installed the Shelby 725 hp packages. Needlessly to say, my little 351C-4V was running with some Big Dogs during the 140 mile trip (LOL). Cruise may not be the best word as we were running a little late and once on the interstate 85 mph seemed be their norm. I was too busy trying to keep up to pay much attention to the speedometer. But I did notice my dash mounted GPS coming back through triple digits several times. Anyways the old warhorse hung with them pretty good and couple of them said they were impressed. I really had to clean the exhaust off the my chrome tips and backend of my car once we arrived as I really blew it out. I opened the door going from the house to the garage & stared at it & said to it now that all the stuff from outside we packed in the garage for the hurricane is back outside I can get back to work on it. I see your point... Your hair covers it nicely! I am not criticizing in anyway, just making a suggestion. Assembling the headlights and moldings on the headlight assembly is so much easier before it is mounted to the fender. The spring that is attached to the headlight buckets is pulled back and clipped on from the back. You risk scratching your nicely painted headlight assembly trying to do it from the front, though it can be done. Putting on the molding is much easier. Looks nice! Good luck! 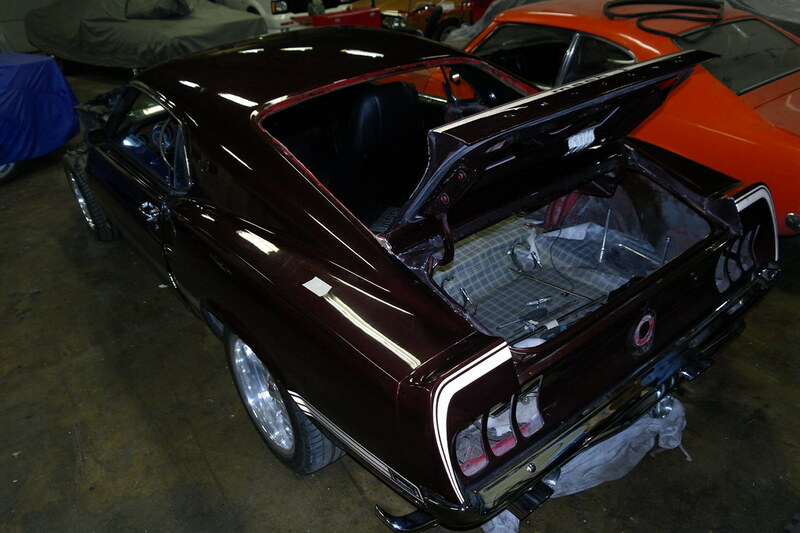 I did not work on a mustang today as I do it 6 days a week and need a day of rest. I fixed the engine ground, now she starts up nice and strong. I installed the black Monte Carlo bar, as well. I attempted to put on a carb spacer. Didn't workout... the spacer I bought didnt have the holes in the right spot. I'll have to pick up another one; probably edlebrock, since that's what my intake mani is. Hopefully that can be done by the end of the day, or tomorrow morning, latest. Well up in Albany it is already getting pretty cold. So the only thing that I have done lately is Pertronix module and coil (Starts faster and idles way better. Best bang for the buck. I take the old points and put them in a bag and keep them in the car in case I blow the module) and a 13" air cleaner came today that was back ordered. I also might have found a 5.0 block and T-5 tran for the winter project. The guy wants $950 for a short block, bell housing, and tran. Spent money on T5 and bellhousing and clutch. Last night while I was supposed to be taking out the trash I sat in mine and made some vroom sounds while enjoying my last Sam Adams Octoberfest of the season. I've been buying parts to (HOPEFULLY) move the engine from the 94 donor chassis to the 69 over the Thanksgiving week. I have received the Ron Morris fully adjustable engine mounts (bought the set with both stock and 1/2" lowered so I don't get in and find out I should have gotten the *other* set), NE Performance Mustang's T5 crossmember and a bunch of gaskets from AutoZone. Ordered today was a replacement oil pump pickup tube for my Moroso 9qt pan ("misplaced" my old one) and a replacement dip stick (probably with the old pickup tube). To be ordered either Friday or Monday will be complete stainless brake lines so I can swap out the lines in the engine bay before dropping in the engine. 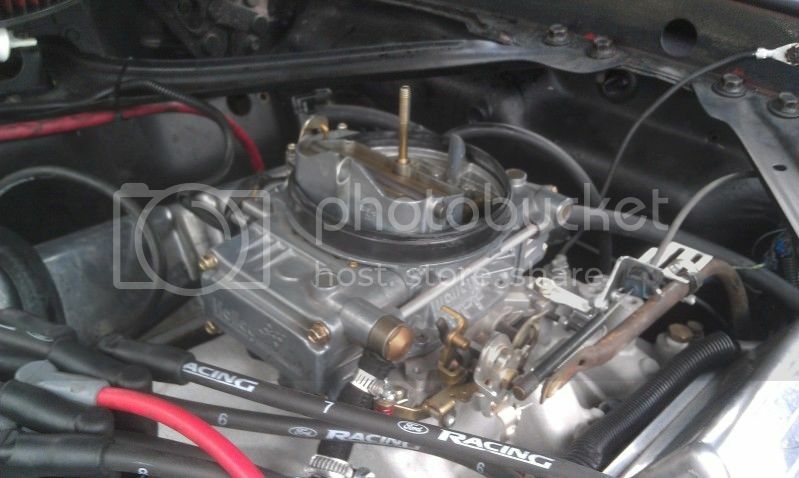 Also on Monday, I will drop off my oil pan, timing cover and intake manifold for a good cleaning. PS: Forgot to mention acquiring an old MSD 6A (6200) box for $75. Once the car is running again, I plan to wire that in. Nice! Post pics of all the work... let's see it! Cleaned her up a bit and put in a new gasket. Which carb do I have? I tried looking it up and a few others with similar part #s (not exact) came up. You can always follow the car by clicking on the link in my signature. Work is always slow. Looks like a Holley 600 CFM with electric choke.